Jonathan Chiswell Jones works with Kerry Bosworth making and decorating fine pots by hand. 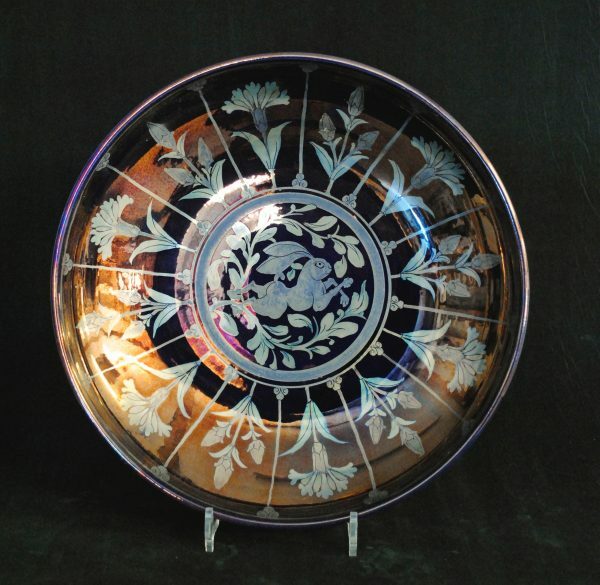 As artisan potters, they accept commissions both for porcelain and for lustreware. Their aim is to produce work which is practical, beautiful, and unmistakably theirs. Jonathan trained at Farnham Art School and then with Joe Finch in Scotland. The ideas which inspired him came from Bernard Leach’s A Potter’s Book, which he read as a schoolboy. After studying at Oxford and working as an English teacher, he found his vocation and has been a full time potter since 1974. Kerry Bosworth trained at Derby completing a two year HND course. She joined Jonathan as a part time helper in 1995, and has worked full time with him since 2002. She studied calligraphy with Ewan Clayton and does the brush lettering on commissioned pots, as well as most of the throwing and decorating of the porcelain. For the first 25 years, the pottery was located at Drusillas Zoo park in Sussex. The early work was made using a stoneware body, glazed in brown or white. In the 1990’s the change was made to brush decorated porcelain. Almost everything was sold from the pottery showroom. The move to a beautiful but quieter location in 2000, brought fresh challenges; but the new gas kiln made it easier to experiment with and then to produce reduced lustre. This is Jonathan’s consuming interest today. Kerry throws and decorates much of the porcelain oven and tableware. This is robust enough for daily use, and shows off the brushwork which has become JCJ Pottery’s trademark. Both lustreware and tableware can be bought from the pottery showroom in East Sussex, as well as from retail outlets: The British Museum; Blackwell Arts and Crafts House; The Craft Potters Association; The Watts Gallery and a number of other galleries in the South of England, in Suffolk and on the Scottish borders. Jonathan is a selected member of the Craft Potters Association, and a member of the Sussex and Surrey Guilds and sells through their shops and exhibits with them.